This past month NYFC welcomed three new members to its advisory committee. We are excited to be working with these extremely accomplished farmers and advocates who bring with them a diverse range of experiences and skills! In order to better acquaint them with the NYFC community, we will be posting a quick introduction of each over the upcoming week. The first new board member is Tess Brown-Lavoie. 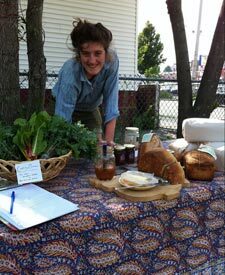 Tess is a first generation urban farmer in Providence, RI. She and her sisters founded Sidewalk Ends Farm in 2011 after Tess graduated from the Gallatin School at NYU. They grow a diversity of fruits and vegetables in two vacant lots on the West End, and market to restaurants and at the farmers market through the Little City Growers Co-op, an 8-year-old urban and peri-urban co-op in Providence. They also co-manage the only urban CSA in Providence with fellow Little City member, Front Step Farm. Sidewalks Ends participates in a hyper-local food economy in which food is grown, sold, and consumed within a small radius of the farm. They rely on bikes and bike trailers to do most hauling and heavy lifting, using bicycles to bring produce to market and restaurants, to collect compost-bound food scraps, and even to collect scrap wood to build raised beds. The farm also hosts a series of workshops and tours throughout the growing season. Tess learned how to grow food in city lots in Providence and on rooftops in Brooklyn, New York, and she is interested in integrating city farming into the landscape of American agriculture. She believes that urban farms will be vital to urban development. They create opportunities for city residents to learn about food and farming, enable environmental progress through the remediation of lead soil, and spur economic development through the generation of local jobs and businesses. This year, Tess and her colleagues in Providence started a coalition of urban market growers to investigate the needs of and obstacles facing urban farmers, and seek feasible solutions. She hopes to bring some of the momentum from this work to NYFC. Tess also serves on the board of the New England Farmers Union.